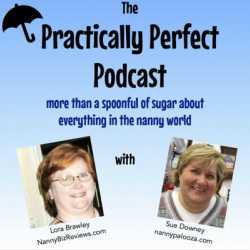 This podcast is the musings of Nannypalooza’s own Sue Downey and Lora Brawley of NannyCareHub.com We don’t sugar coat things- we just question and consider topics relevant to nannies. We talk about everything from why many nannies struggle with their weight to nannies in the news to what to get your employers for holiday gifts! We welcome input from our listeners! Want to sound off on a topic? Want to tell us we are crazy? We would love to have you join us on the show! Email us! Be sure to access them all or sign up for the feed visit the webpage! Scroll down for a library listing of our most requested shows! Should You Leave Short Term Jobs Off Your Resume? Are Nannies Like a Third Parent? Do Nannies “RAISE” the Kids They Care For? How Do You Course Correct?